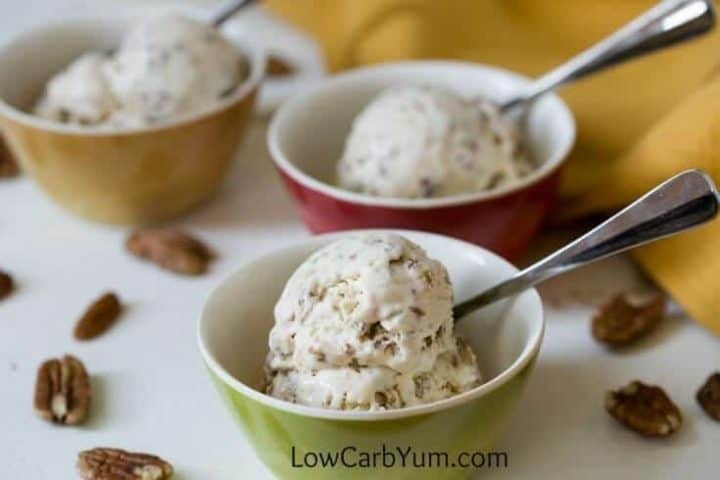 The best low carb butter pecan ice cream recipe ever! 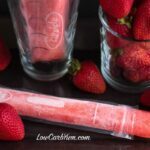 It’s smooth and creamy and scoops well after frozen. You’d never know it’s sugar free! Nothing helps beat the heat better than ice cream! Don’t you agree? My family loves to go out for ice cream in the summer. And, we have one of the best store made ice cream shops right down the road from us. Unfortunately, there are only three ice cream flavors that have no sugar added. All of them contain maltitol and none of them are store made. The three no sugar added flavors offered at this premium ice cream shop are pecan caramel, raspberry cheesecake, and moose tracks. I’ve tried them all and the pecan caramel is my favorite. I don’t think there is a lot of maltitol in the ice cream because I’m usually okay after eating it. 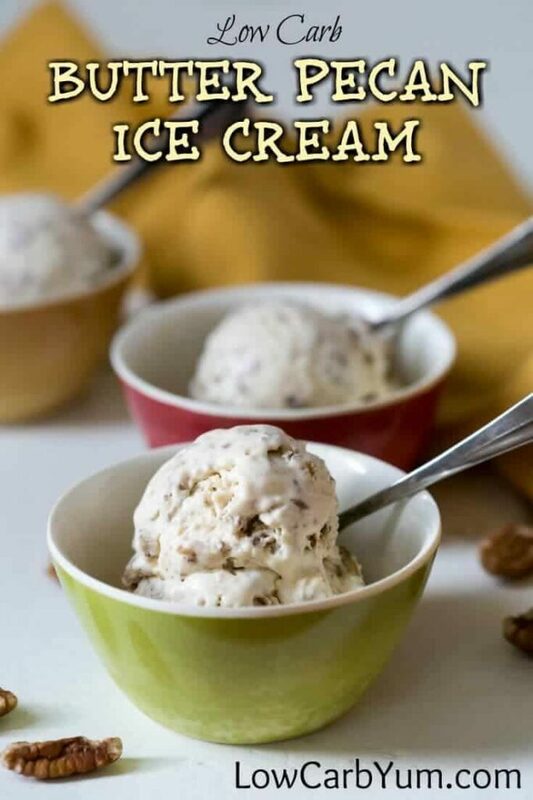 It also doesn’t seem to affect my weight so I don’t mind treating myself with the no sugar pecan caramel ice cream when the family goes out for a summer treat. However, the ice cream is really expensive so I wanted to try and make a similar flavor at home. The thought of making a homemade caramel sauce wasn’t really appealing to me. I didn’t want to have to take that extra step. 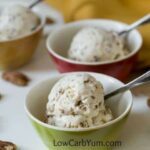 So, I chose to make a low carb butter pecan ice cream recipe. The recipe was inspired by a recipe I found over at Epicurious.com. 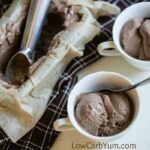 I find the texture of low carb ice cream is best when made with a fiber sweetener. 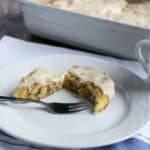 For this recipe, I used LC Foods white inulin sweetener which combines chicory root, stevia, and monk fruit. And, there’s only 2.5 grams of fiber carbs in each teaspoon. You can find this sweetener on the LC Foods website or at Amazon. Another way to ensure a nice texture is to use egg yolks. One could argue that this makes it a frozen custard rather than ice cream, but it’s really hard to tell the difference. 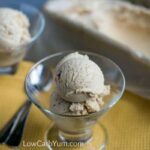 That’s why I’m calling it a low carb butter pecan ice cream recipe rather than a frozen custard recipe. Like all homemade ice creams. You’ll need to let this sit out for a good 5-10 minutes before scooping. But, after that, it scoops really well. The pecans are roasted for a few minutes before using, then are topped with salt and butter. The flavoring soaks into the nuts as they cool giving them a buttery flavor. 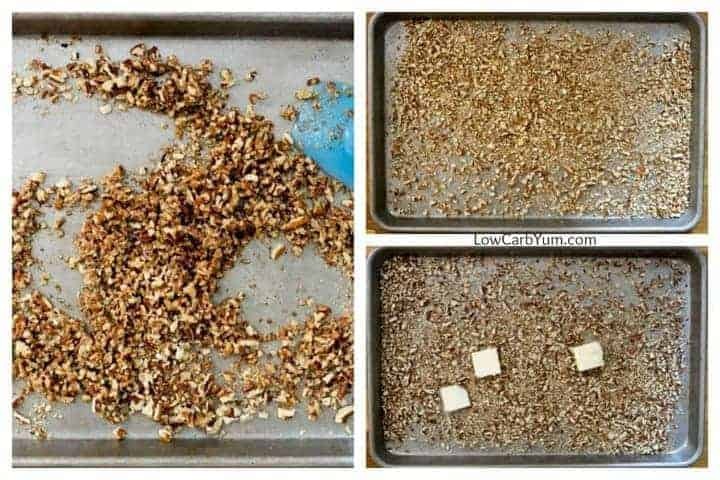 I prefer the pecan nuts to be chopped. 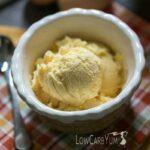 This not only allows more of the butter flavor to soak in, but they also blend in better throughout the ice cream. 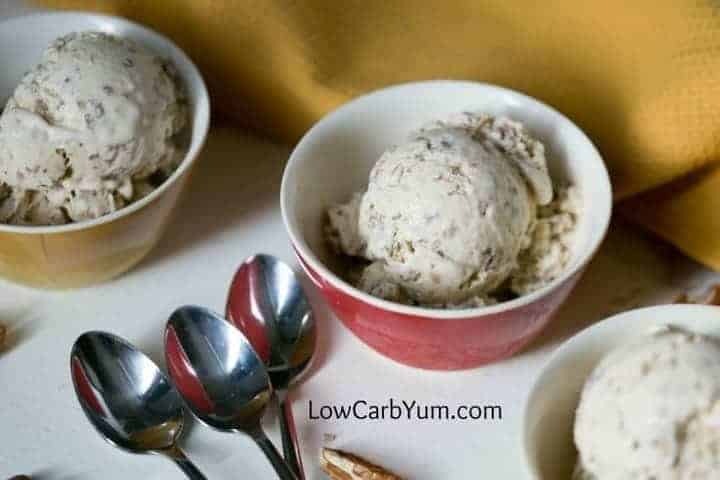 The resulting low carb butter pecan ice cream is as good or better than any premium ice cream I’ve ever tasted In fact, I doubt anyone would guess that it has no sugar added. In addition to the fiber sweetener, the low carb brown sugar alternative Sukrin Gold was used. 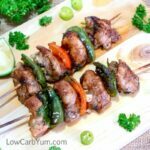 This enhances the flavor of the buttered pecans. 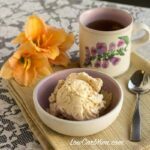 If you love butter pecan ice cream as much as I do, you’ll give this recipe a try. It may sound like a lot to use the specialty sweeteners, but these are ingredients I always keep stocked in my kitchen. Of all the inulin based sweeteners out there, the LC Foods white inulin is my favorite. 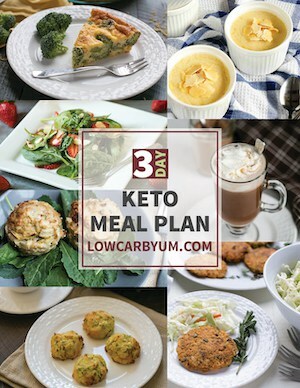 It has the lowest carb count I’ve found and tastes great. Sukrin Gold is the only low carb brown sugar substitute that I use now. In the past, I used to add a little blackstrap molasses to regular granular sweeteners. But, molasses does contain natural sugar so many would rather not use it. Toast pecans in baking pan with lip until fragrant (about 7-8 minutes at 350°F). Add butter and salt to hot pecans, tossing until butter is melted. 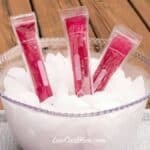 Set aside to cool completely. Whisk together the Sukrin Gold, inulin sweetener, and xanthan gum. 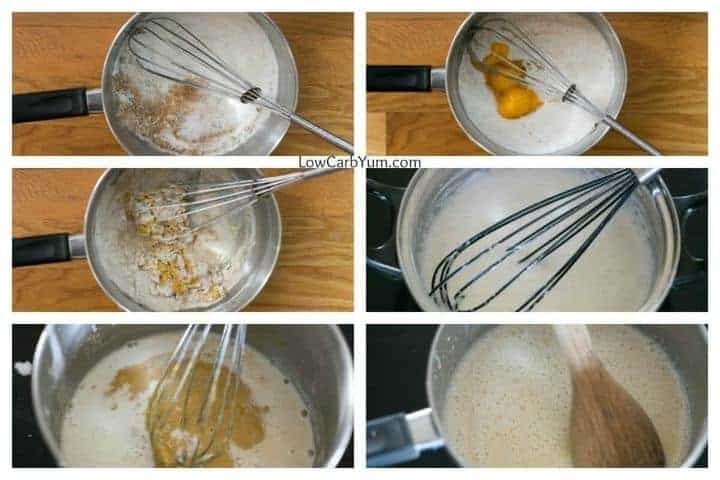 Add in egg yolks whisking until combined into the sweeteners. 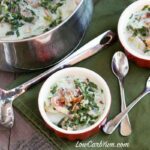 Bring cream and low carb milk just to a boil over moderately high heat. Add hot cream mix to egg mixture in a slow stream whisking constantly. Cook combined mixture over low heat, stirring constantly with wooden spoon until thick enough to coat back of the spoon and temperature is 170-175°F. Stir in vanilla after removing from heat. Pour into heat safe bowl then cover surface with wax paper. 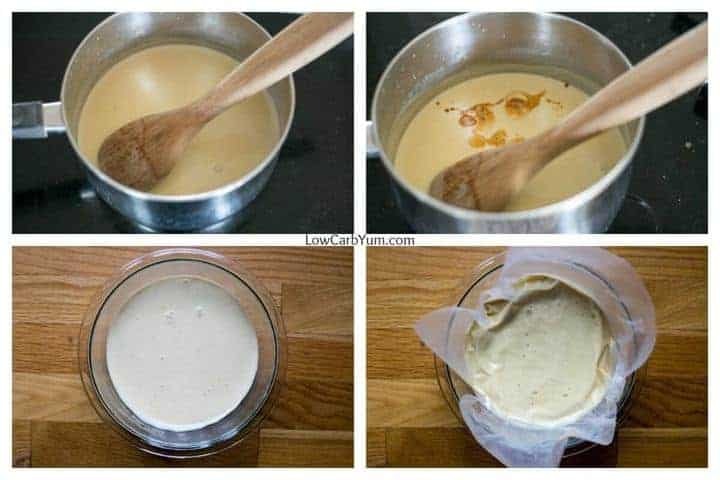 Freeze custard in ice cream maker until almost firm. 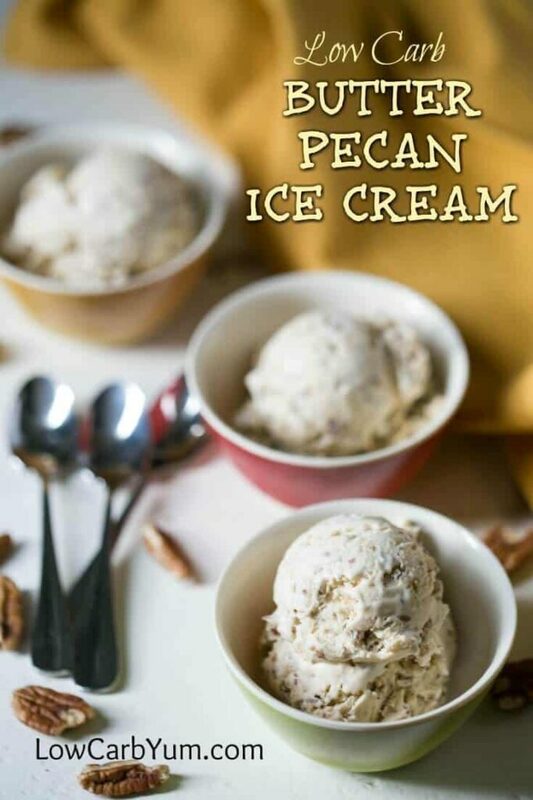 Stir together ice cream and pecans then transfer to an airtight container and freeze until hardened. 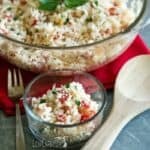 1.7g net carbs per serving. 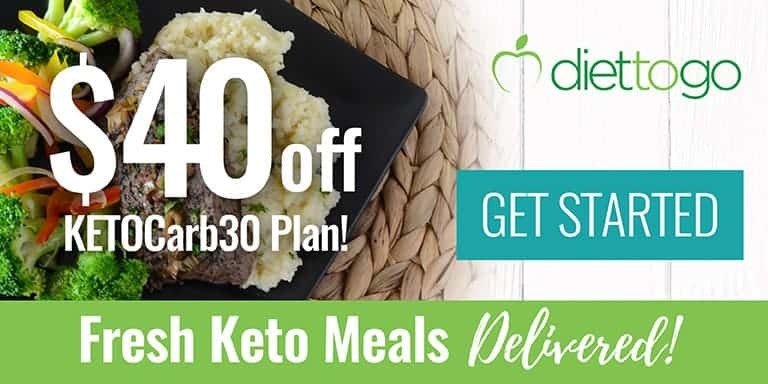 Each serving contains 10g erythritol.